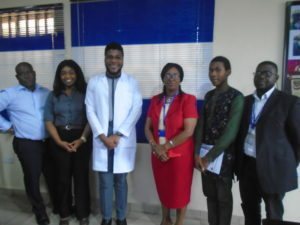 The debate society, Aristotelian Debate Congress, recently paid a courtesy visit to the Vice-Chancellor Igbinedion University, Okada, ahead of its preparation to organize its maiden Inter-School debate competition featuring students in all Secondary Schools in Ovia North East Local Government of Edo State. The President of the group, Dr. Uchenna Ibezim, a Medical Doctor and graduate of Igbinedion University in his address noted that the organization which was formed six months ago is launching its first competition for secondary school students in Ovia North East Local Government Area on the 29th of May, 2019 at the IUO Staff School in Okada. According to him, the choice of Igbinedion University Staff School as the Venue for the maiden edition of the competition was strategic because charity should begin at home. 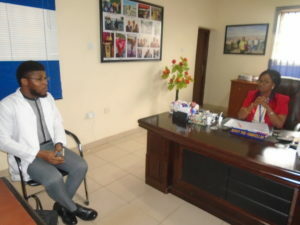 Responding, the Vice-Chancellor Prof. Lawrence Ezemonye, represented by the Deputy Vice Chancellor, Professor (Mrs.) Deborah Odejimi expressed the joy of the University that the debate society is being championed by a Medical Doctor trained in Igbinedion University and currently on his housemanship at the University Teaching Hospital in Okada. She commended the dedication of the President of the group, Dr. Ibezim whom she described as Debate Personified owing to his sterling profile as representative of the University in his undergraduate days in all debate and public speaking competitions within and outside the country. These include; the Impact Africa Debate and Public Speaking Championship in Botswana (2017); Impact Africa Debate and Public Speaking Championship in Ghana 2016 among many others. She congratulated the Aristotelian Debate Congress for planting a good seed which in no time would grow to impact positively on the larger Nigerian Society.